The art of getting close to wild animals has been replaced by high-powered rifles and telephoto lens. Like other lost skills of self-reliance, a revival is in order. One man fanning the primitive fire is Mark Warren. A soft-spoken man, reverence and passion for nature and her bountiful resources flows from his life like a refreshing mountain stream. My time at Medicine Bow, Warren’s Primitive School of Earthlore near Dahlonega, Georgia, challenged not only my physical abilities, but awakened my mind and spirit. As young boys, my brother and I spent countless hours re-enacting exploits of woodsmen we either read about or watched on TV. Fiberglass bows in hand, we’d crawl through fields of broom sedge and pop up as close to a cow or flock of robins as possible. Our cows would give us their usual stare and continue grazing. Farm animals were easy to stalk. Why learn this lost skill? The obvious benefit is for hunters with primitive weapons. Harvesting animals with a hickory self bow requires that you be as close as possible to the intended target for a clean kill. You owe that much to the animal for providing meat and resources for sustainability. Observers and photographers of wild animals would do well to practice stalking techniques. Doing so may revel phantoms of the woods you’ve only dreamed of capturing in your lens. The main benefit I personally received under Mark’s instruction was the complete immersion in nature. Slowing down to a snail’s pace uncovered small, “invisible” wilderness details unnoticed when trekking full speed ahead. Connecting to our ancestral roots always feeds my soul and waters the primal tree. An analogy Mark often used was that of a rock tossed into a pond. The impact ripples to every shoreline. The idea being to minimize your wake in the animal’s living space. Follow along as I break down what I learned about making a successful stalk. Native Americans learned to stalk by observing interactions between predator and prey. Drab colored animals like deer, rabbit, and fox have evolved away from color vision to survive. Their ability to blend into their surroundings as predator or prey renders color recognition unimportant for survival. Now the rods in their eyes dominate to detect motion in their field of vision. Working the wind correctly and being camouflaged helps conceal your presence but movement is the worst offender of blending into the forest. Sound may alert wild animals, but our movement is what causes them to vanish into the brush like smoke. This is the main reason the forest appears void of wildlife when we thrash along in our human gait. We must s-l-o-o-o-w down to ultra-slow motion and take a form not easily recognized by wild game. Which reminds me of one of my favorite lines from the movie Jeremiah Johnson. Elk don’t know how many feet a horse has! No, you durn fool, slide it up over the saddle. Stalking is a game of practice, and practice makes permanent. One stalking step, done correctly, should take about two minutes on average. To be honest, my steps take about one minute when my legs are fresh… less as my stalk continues. Think and walk like a fox. Its gait is like walking on the baseline of a gym floor. No right-to-left swagger or bobbing up and down… just a narrow, smooth, streamline glide. Human locomotion demands that our body be thrown out of balance to one side or the other. And then there’s our heel strike. 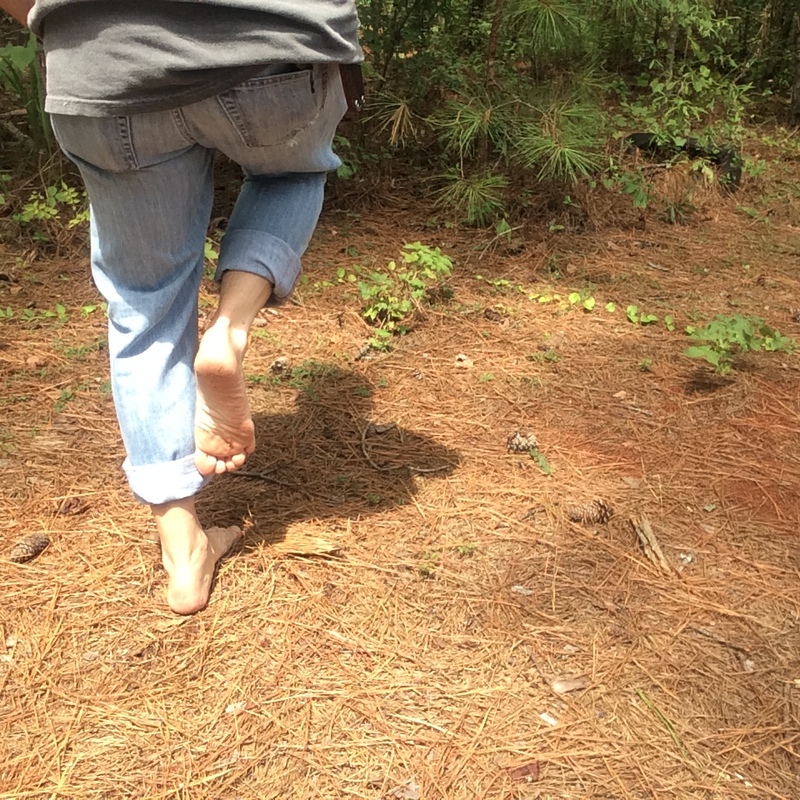 Lift one foot and move it forward until our heel impacts the earth sending alarm waves throughout the forest. 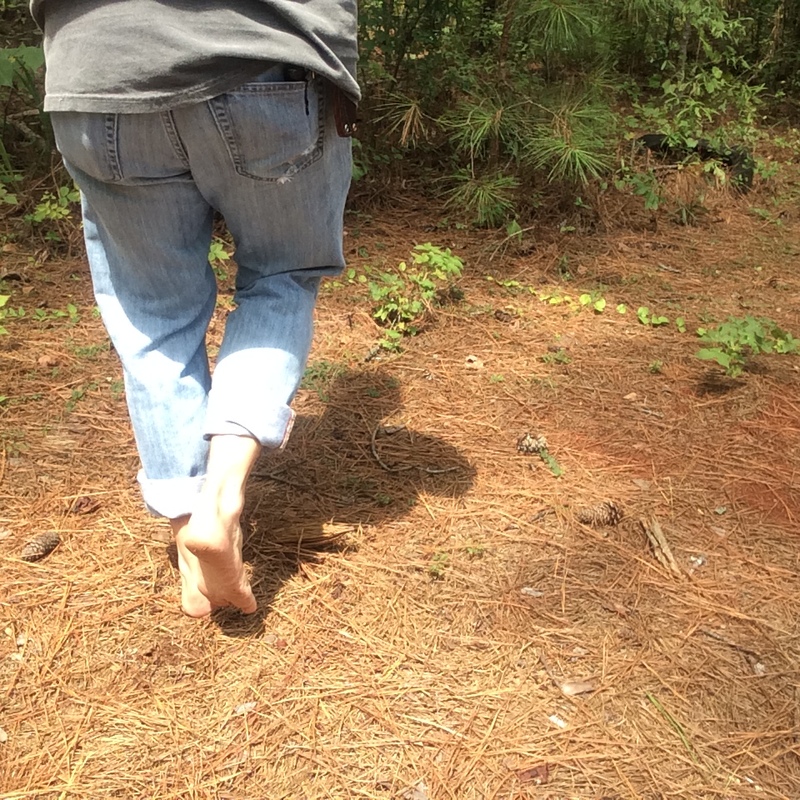 When I run for exercise, which is rarely these days, I prefer to run barefoot. This method of running will quickly teach you not to strike your heel first on each landing. 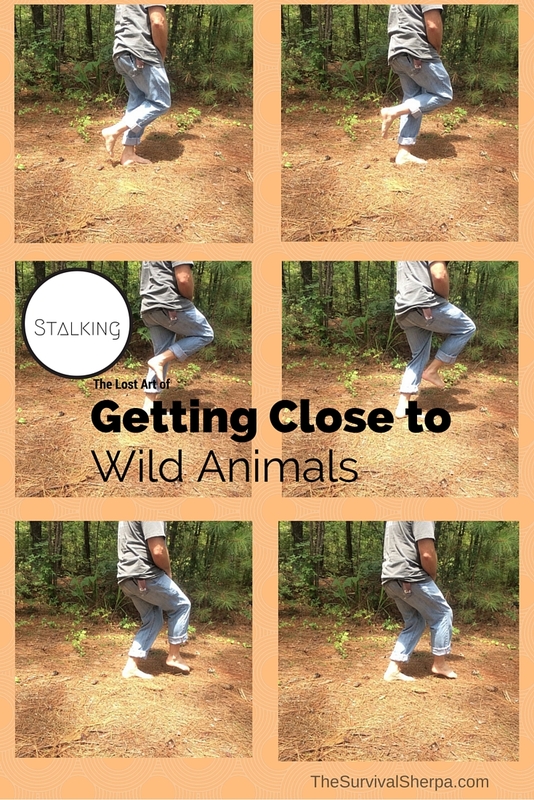 My posture and foot strike necessitates a smooth, floating motion… which is the goal when stalking. To demonstrate our unbalanced movement, Mark assembled our class in a straight line facing him. From a balanced position, feet shoulder-width apart, he gave the command, “walk”. Within a nanosecond, the command “freeze” was given. Our side-to-side shift was obvious. Try it yourself with a friend. Animals know this distinctive sway as human and avoid the lumbering figure in the woods. This technique of walking like a fox is very demanding. Here’s a short video of my fox walk. Notice the shakiness in my front leg. And this demonstration wasn’t even in ultra-slow motion. I have a new appreciation of all who’ve come before us who stalked within a few feet of wild game… Mark Warren include. 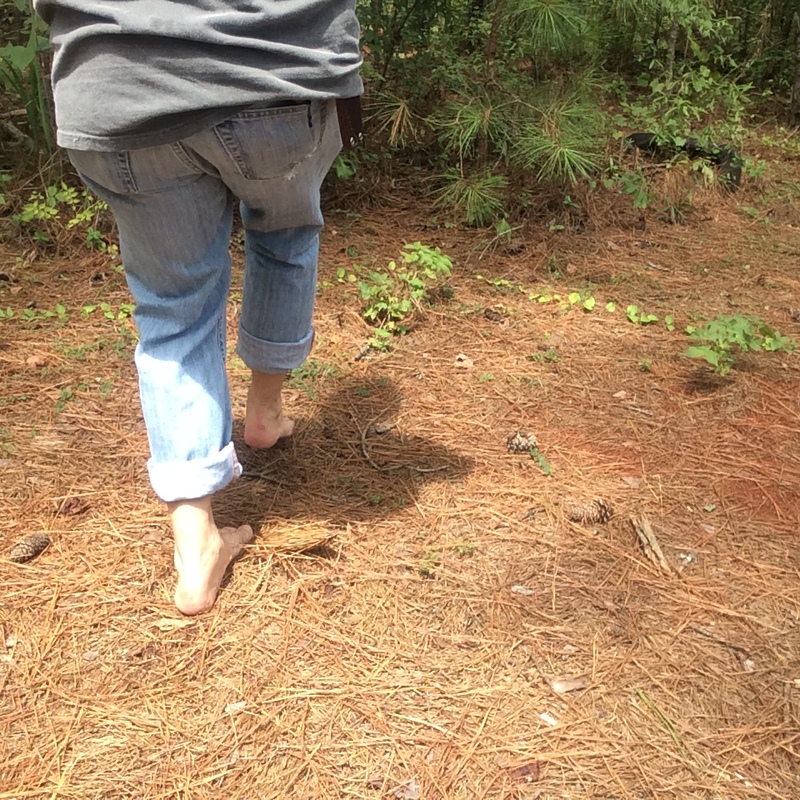 No matter how delicately I placed my forward foot on the forest ground, my novice stalking legs would lose balance and crack a twig or crunch leaves from time to time. Sounds alert animals. But sound is not always a deal breaker when stalking. The forest is full of sound. Keep your eyes focused on the target the duration of the stalk so you can freeze at a moments notice if animal stares in your direction to investigate the sound. There were many times during the class that students had to hold a stance in awkward positions. One exercise included Mark mimicking a deer. We encircled him at a distance of 15 yards or so and had to stalk towards him as he foraged and pawed at wild food. His mannerisms on all fours were amazingly similar to white-tailed deer I’ve observed. If Mark spotted us cutting corners on our technique to the point of alerting him, he would snort and wheeze like a deer and point at the offender to go back to the starting line. If he lifted his head in our direction we would have to freeze like a heron hunting in knee-deep water… no matter the cycle of ultra-slow motion. Quadriceps and hip flexers screamed silently hoping the “deer” would bow and graze again. I enjoy Primal/Paleo workouts. The level of functional fitness needed to stalk wild animals is different from any sport or recreational activity I’ve ever experienced. My legs and hips were sore for days after the class. Mark told us that martial artists found the most success of anyone attending his stalking class. Even more so than professional athletes. It isn’t necessary to spend a fortune on expensive camouflage clothing. Wear quite, loose-fitting clothes of natural material with a varied pattern that will break up your silhouette in the forest. Avoid the swish of synthetic material rubbing together. Oh yeah, the sound of clinking metal is a sound made only by humans in the woods. Check your pockets and gear before heading out. Remembering what we learned about the role of rods and cones in wild animal eyes, even the popular pink camo patterns will work for stalkers. A bit of cooled campfire charcoal smeared on your face and exposed skin may appear too Rambo for some but will certainly dull the shine. A wise stalker prefers a position with the wind blowing his human scent away from the animal. Even with the wind in your face (upwind), a cover scent such as natural plant material crushed and rubbed on clothing helps hide your human odor. You could also go the commercial route and apply cover scents and scent blockers. The best teacher is the one who always remains a student. Mark Warren’s appetite for woodslore and primitive skills is demonstrated by his passion to inspire others to get out there and experience nature firsthand. I think I’ll keep my student status.